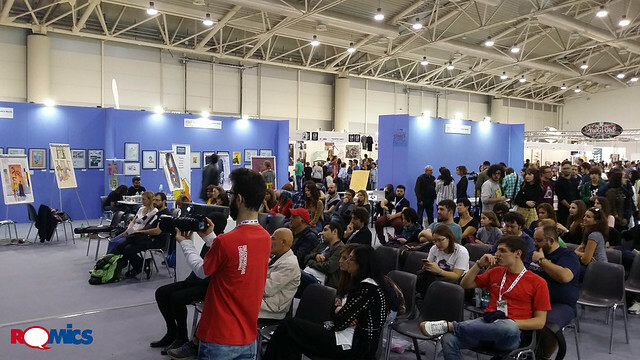 Comics City has made its return at Romics , with an ever greater space dedicated to comics meetings, live drawing, B2B area, new talents, murales and dedicaces. Previews, meetings, official launches and exhibitions; a space where all expressions of creativity have come to life. Inside the Comics City: exhibitions, big panels and walls of artists, non stop live drawing, dedicated to one of the main topics of the festival, ’68 The number of the change - RevolutionArt. 12 artists for the '68, live painting of artists of Scuola Internazionale di Comics; the Exhibition tributed to Evangelion and the double twenty year anniversary with Sci-Fi Anime Attack Exhibit and Take My Revolution! Utena 20th Exhibit, the exhibition dedicated to the 25th anniversary of Scuola Romana Dei Fumetti, The italian pencillers who have won the Romics Comic-books Contest, an exhibition itinerary on the large variety of italian comics. The bookcase filled with novels for children, thrillers, fantasy, illustrated books and graphic novels; the habitual Sala Comics City, with round tables and meetings with italian and international authors, the latest news by the publishers, masterclass; dedicaces area, where you have come face to face with your favourite author; B2B area and New Talents, a place where publishers and new talents have met and got to know each other. Many meetings and presentations on the stage; ‘Il tuo prossimo fumetto non sara’ un fumetto’ with the presence of editors Simone Balzano, Marco Gotta and Pasquale Meschino; ‘Diabolik as seen by Zaniboni’ – An encounter with Mario Gomboli and Giuseppe Di Bernardo; ‘Salvezza’ by Marco Rizzo and Lelio Bonaccorso, the odyssey of Acquarius ship through the comics at Romics; ‘Charlotte Gastaut: a special talent between fashion and illustration; ‘Le Edicole ai tempi delle Librerie’; Asilo Savoia and SRF have presented ‘La Grande Guerra a Fumetti’ with “Talento & Tenacia”; The’68 and its various heritages: Stefano Casini, with his book "Gli anni Migliori" (Tunuè) set in the ‘70 and Gianfranco Manfredi; Marco B. Bucci and Jacopo Camagni with the new novel related to the urban Fantasy universe of their comics series Nomen Omen - The Fall (Panini Comics), “Schiele. Il corpo struggente” with Paolo Parisi and Otto Gabos, and many other events.